Whether you're a big family or a small business it's surprisingly cheap to get an internet address and to create an online presence for years to come. And if you buy a cheap unlimited Broadband service from Freeola, the price includes professional quality internet services such as free email, free web hosting and free InstantPro website builder; all via our £12 Back per month deal. It's not difficult to set up your own email addresses, such as [email protected], or [email protected], or to build a website using an instant site builder such as Freeola InstantPro. Even building an online shop or an impressive photo gallery is relatively quick and easy with InstantPro's drag-and-drop facilities. It's not expensive to run fifty or more bespoke email addresses and one or two websites for your family, club or business. These facilities are free with Freeola's £15.95 Unlimited Broadband package or can be added for as little as £2 plus VAT for the email and £3.64 plus VAT for a website. There is one word to look out for where possible and that's "unlimited". Unlimited is part of our philosophy here at Freeola and GetDotted. Most things are cheap or free, unlimited, professional and robust; using state of the art equipment at secure data centres around the UK. Please read on for all your basic questions answered, in one easy to read page. What is an internet address? An internet address is made up of a number of parts - and this points you directly to the website/webpage that you would like to visit. 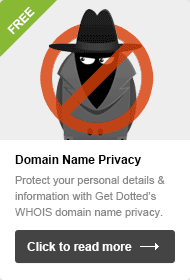 One part of the internet address is the domain name, for example if you take a look in your address bar right now, you'll see https://getdotted.com; the getdotted.com part is our domain name! Each website has a series of numbers (known as an IP address) identifying it, but these numbers aren't catchy or user friendly - so we use domains instead, which link to the IP address. How do I get an internet address? You'll need to register a domain, you can do this via a registrar, like GetDotted.com. Just type in the string of letters that you want (such as company or club name) and you'll be shown what's available. With hundreds of different domain types (such as .co.uk and .com) there's bound to be one that's perfect for you. Check out GetDotted's handy domain search, to take a look at our cheap domains. You can register domains for 1yr, 2yrs or 5 yrs (dependent on domain type). This domain will now be registered to you and only you for that period. The domain is yours for as long as you keep up-to-date with the renewals. For tips on how to pick a great domain, take a look at our guide "Find Your Perfect Domain". You can also try out some keywords in our domain generator to get some ideas of what's available (just remember to avoid any names that might infringe existing trademarks). What happens once I have registered a domain? That's up to you! A domain can be used for a website and/or emails. You can create [email protected], set up a website or even just hold on to it as an investment (you may want to protect a domain from being snapped up - even if you aren't quite ready to use it). Every domain registered with GetDotted comes with Freeola's One-Page Website and Freeola's One Address email for free. When you register your domain, you will also have the option add a three-month free trial of our premium email service, EmailPro. Continue on for more information on how to use your domain for a website or email. I've got a domain; can I create emails at that domain? 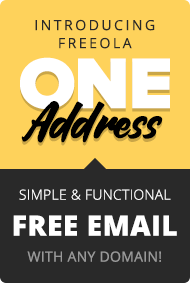 With every domain purchased, you will receive Freeola's One Address - this is one email address free at your domain (such as [email protected]). This will be a fully functional email address with the ability to send emails and access mail via Freeola Webmail Lite. You can create an unlimited number of email addresses at your domain (on top of your One Address), however these additional addresses will only work for incoming mail, unless you choose to upgrade to EmailPro. How do I get these email addresses? You will need to create the email addresses; this can be done very easily from the MyFreeola Control Panel (under Email Settings - then Create New Email Addresses). How do I start using them? You can set them up in your preferred mail client (such as Outlook, Thunderbird or your phone's mail app), or set them up to forward to another email address. Your Freeola One Address can be accessed via Freeola Webmail Lite. If you have Freeola broadband or our premium email service EmailPro, you can access all addresses on the service via Freeola Webmail Pro. Is the email service free? If you have a domain with GetDotted, unlimited POP inboxes are free (allowing you to receive emails but not send via Freeola's servers). There are no limits to how many addresses you can create. All domains purchased from Freeola & GetDotted will receive a free Freeola One Address - this is one email address (at your domain) with an unlimited POP3 inbox, the ability to send emails and the use of Freeola Webmail Lite. In order to make use of the Webmail Pro facility, use advanced spam controls, send mail from our servers and to have an IMAP account (which you can sync across your computer, laptop, tablet and mobile), on multiple addresses at your domain, you'll want our premium email service EmailPro. This is just at £2 (ex VAT) per month, or can be used as part of your monthly £12 Back Deal with Freeola Broadband. A free three-month trial of EmailPro is also available when you purchase any domain. I already have a domain, is there anything else I need to do to get a website? Yes, you will need to select a type of web hosting and assign your domain to it. Then you will need to add content or upload your files and publish. The domain is needed so that people can find your site. Web hosting is basically storage space on a server. You upload your content to the storage space and publish it to make it available for others to view online. Here at Freeola and Get Dotted, we offer 2 types of hosting: VIP hosting and InstantPro (website builder with hosting included). All of our hosting packages are unlimited. This means that there are no limits on the size of your site, the amount of pages and the amount of traffic you can receive. Many other hosting providers may place limits on the size of your site or traffic; with fees or a charge for extra. So, which hosting package do I need? Well it depends on what type of site you're looking to build and your capabilities. Whether you're a beginner or are experienced in creating a site, InstantPro is ideal if you want an easy to use, easy to manage website. Helpful templates and an easy to use interface make it a great choice for users of all experience levels. If you're an experienced webmaster/designer, and you're confident in uploading your files and managing a site, then VIP is a great choice for you. VIP hosting is compatible with many content management systems, such as WordPress, Joomla and Open Cart. How do I assign my domain to the hosting? We've made it really simple to assign the address to your hosting package. Simply log into your MyFreeola account and select My Websites (from under the Web Sites & Hosting tab) - this will list your web hosting services - then simply click the Assign Address button to add your domain. If you buy a cheap, unlimited Broadband service from Freeola, hosting a site or two is absolutely free! All of our cheap Broadband packages include £12 Back Deal each month, which you can spend on any of our hosting services! Alternatively our hosting services can be purchased individually. InstantPro Website Builder (including hosting) is just £3.49 (ex VAT) per month, VIP Hosting starts from just £3.64 (ex VAT) per month. Each domain also comes with Freeola's InstantPro One-Page Website, completely free - so you can begin building your site immediately at no extra cost. You can upgrade to the full-unlimited version at any point. Can you design the site for me? If you feel like you might need some help with your site, here at Freeola we offer a number of affordable web design packages; whether it's just a little assistance that you need or a whole site design. 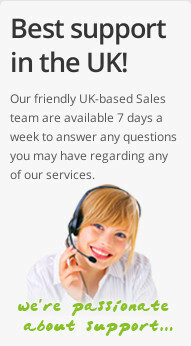 You can check out our web design packages or get in touch with our web design team.